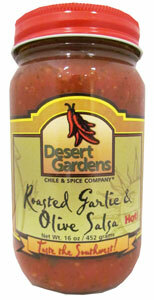 Desert Gardens Roasted Garlic & Olive Salsa Hot 16 oz. Desert Gardens Roasted Garlic & Olive Salsa has generous chunks of black and green olives that combine with flavors of rich, ripe tomatoes, roasted garlic and jalapeno and New Mexico green chiles. 16 oz.